Place tomatoes in a baking dish and under the broiler for 6 to 9 minutes, until charred, mushy and juices have begun to run. Once cool, roughly chop, but don’t discard the juices. Heat the skillet, add the bacon and cook until it is crisp and browned, about 5 minutes. Add the meat and season with salt and pepper and sear for about 2 minutes per side. Add in the onion and jalapeño and let them soften for 2 to 3 minutes. Add the garlic and before it browns, in less than a minute, add the chopped tomatoes. Stir here and there and let it all season for about 4 to 5 minutes. In a skillet or comal, set over medium-low heat, heat the tortillas. It will take about 1 minute per side. Place the tortillas in a tortilla warmer or wrap them in a clean kitchen towel or cloth napkin. 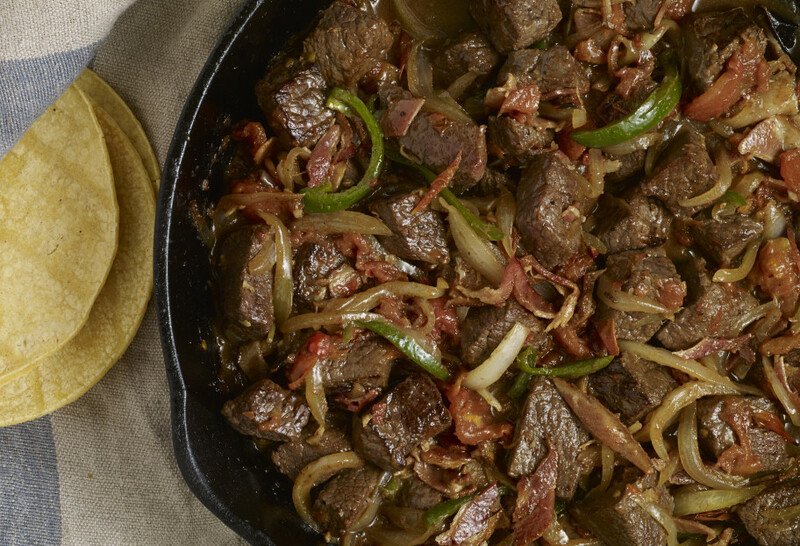 Serve along with the tenderloin tips; guests can fill the tortillas with the amount of filling they desire. Looks taste and delicious. I am going to make it over the weekend. Looks similar to a dish I make less the bacon. Have fun cooking them this weekend, Letty! That’s a great cut of meat to also use! i have come to realize this dish is also better the next day warmed up it’s my favorite taco to make, am making it for a family hangout this Saturday. you know what is my wife’s favorite? I use the meat to make a taco but inside I add mozzarella cheese and a little salsa verde and I crisp it up she just loves it. Oh these make great leftovers. Have a fun family hangout, Carlos! I made these after watching your show. They were so delicous that even my son-in-law, who is from Cajun country, liked them very much. Thanks for the recipe. So happy to hear that Karen – thank you. My husband and I are making this today. We can’t wait to try it. It looks so good. Thank you for all your recipes. I have been watching your marathon on pbs yesterday and again today. I love all of your shows. It is only 10 minutes for the meat to be full cooked? I am missing something ? Make sure you cut the meat into small 1″ cubes, and sear each side…and it will all be cooked. But you can always cook for longer if you like. I use this recipe now as my base recipe even for other dishes. I made lamb kofta balls the other and they were amazing. Great recipe. I love this recipe! It’s soooo good!!! Thank you Pati! !